Two Egyptian asylum seekers on a hunger strike to demand refugee status were sent to a hospital Wednesday after losing consciousness. According to the civic activist group Friends of Asia, Anas El Aasal and Mona Mohammed were receiving medical treatment after being transported to a local hospital. Anas had been on a hunger strike for 19 days and Mona for six days. The two asylum seekers were on a hunger strike in the scorching heat in front of a police station in Hyoja-dong, near the Blue House. Former journalist Anas came to South Korea in 2016, and Mona entered the country in 2017. Mona came here with her husband after studying medical science in college. 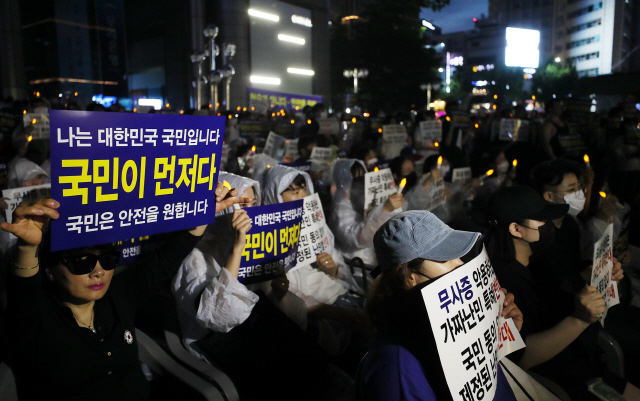 “Doctors have already expressed concern over the asylum seekers’ health, but the Korean government has remained silent and indifferent,” Friends of Asia and another activist group said. Abdelrahman Zaid, who was also on a hunger strike, held a press conference to urge the Korean government to take “appropriate” legal measures against anti-refuge sentiment in Korea. Calls have mounted for the tightening of asylum laws following an influx of Yemeni asylum seekers to Jeju island. “Refuges were frustrated by the anti-refugee sentiment and the government’s lack of response. They have no choice but to return home and die. The government should listen to their voices,” the group said.